Sunny 11-12C with light wind. Delighted to see 3 Migrant Hawker Aeshna mixta about my 'bog' which is now full after all the rain recently. A male in immaculate condition (will upload photos sometime) and a couple in wheel position. I also got a look at this male and his wings were a bit worn. Didn't get another look at female. I forgot to mention that I saw 3 Migrant Hawker Aeshna mixta about my lake on the 6th, which was just before the storm on Monday. Note: that as far as I'm aware that there are NO november records of Migrant Hawker in the national database. 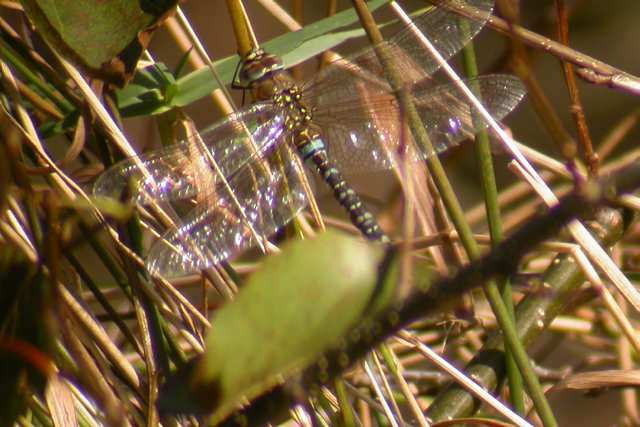 Myself and Janet Whelehan saw two Migrant Hawker Aeshna mixta about 2km south of Cahore Point in Co. Wexford. I saw 4 male Common Darter Sympetrum striolatum at Peatlands Park, North Armagh, in early afternoon today (5th November); 2 of these were in the "Bog Garden" and another 2 around a small flooded area on the track between Mullenakill Wood and Annagarriff Wood. All seemed to be males; 2 seen at close quarters seemed to be in excellent condition with little or no tears in the wings. Weather was bright with a mdoerate to fresh SW wind and with an estimated temperature of 12-13 deg. C., ie rather mild for the time of year. A Red Admiral butterfly was also seen. There was no sign of Black Darters though. I saw 2 male Common Darter Sympetrum striolatum in good condition in the Bog Garden at the Peatlands Park, North Armagh, this afternoon (1st). Weather was bright with a moderate to fresh wind, but the temperature was rather cooler than of late, probably c. 10-12 deg. C. I examined other areas of the Park without success. I was somewhat disappointed not to see Black Darter, which I have seen there regularly in early November in recent years. On Sunday 30/10 while birding on Howth Head, County Dublin, I had a small aeshna which was almost certainly a Migrant Hawker Aeshna mixta, possibly a female, flying low over a field in a mild blustery wind. I did not see it land. I would belatedly add that I had another small blue aeshna, almost probably a male Migrant Hawker Aeshna mixta at Sorrento Point at Dalkey, County Dublin on 15/10. Neither specimen gave particularly good views. A lot of wet, windy and dull weather in recent days, but has been very mild. During some sunshine today, a Migrant Hawker Aeshna mixta foraged over my meadow for at least 30 minutes. Didn't check for Darters, still a probablity that some may be present. Just for your information, this afternoon (Sunday 23rd Oct, c15.00 hrs) I watched a male Migrant Hawker Aeshna mixta patrolling a sheltered stretch of pathway, at Churchtown (near Carne) Co. Wexford. It was overcast at the time, but decidedly mild for the time of the year, with little wind. Yesterday (23/10/05) being mild with good ambient temperature from 11.00am on, I went to Glendalough in County Wicklow. There was a weak sun with no wind and the temperature gradually climbed until circa 14.45. I had 15  20 Common Darter Sympetrum striolatum with at least 3-4 pairs in tandem around the lower and upper lake and 1 stunning male Common Hawker Aeshna juncea in pristine condition which allowed confiding perched views. It took flight twice to inspect me affording excellent fly bys and clipping my head before disappearing off down the track beside the upper lake. I also had distant views of what may have been 2 Black Darter Sympetrum danae. I saw a mating pair of darters, which I feel sure were Common Darter Sympetrum striolatum (from size, habitat and lateness of date) at an unnamed lake at Scollogstown near Tyrella, Downpatrick, Co. Down (J483487) today (22nd). Weather on 22nd was mainly bright and mild with little wind though it clouded over from mid afternoon. Got a lot of sunshine today, something that has been very scarce this month with 8 sunless days so far. A single male Migrant Hawker Aeshna mixta and at least 4 pairs of Common Darter Sympetrum striolatum and other males present. It was cloudy on Monday 17th October, but single Migrant Hawker Aeshna mixta was on the wing in East Coast Nature Reserve, Newcastle, and one in my garden later. On 15th October I had a lot of Migrant Hawker Aeshna mixta activity around my lake. 4 females were ovipositing, and there were about 4 males seen as well. 3 of the females were ovipositing into Bulrushes (Reedmace Typha latifolia) and the other into Common Reeds. One of the females was ovipositing into the seedheads and leaf tips of the bulrushes. She even went upside down to insert eggs into top of the seedhead. She also tried some older stems, but assuming that she found them hard, she quickly moved on. All this within a couple of feet of me. The seedheads in question are about 2m above waterlevel and they can persist well into summer, unless the swans take them down in the spring. Of the other 2 ovipositing into the Reedmace, one was fairly near the water, and the other was somewhat inserting the eggs at a height in between the 2. At Peatlands Park, North Armagh, on 17th October (a very mild afternoon with hazy sunshine) there were 2 male and 1 female Common Hawker Aeshna juncea (1 male and 1 female were caught and were in fair condition), about 4 Black Darter Sympetrum danae and about 8 Common Darter Sympetrum striolatum. For the record, I am still seeing plenty of presumed Migrant Hawker Aeshna mixta at various coastal sites in Wexford ( Hook Head, Wexford on 5 October, Churchtown (near Carnsore Pt) on 8th October(at least 3) and c4 at Tacumshin Lake, yesterday) whenever the weather is reasonably good. I admit that at this stage I am inclined to assume all of the late hawkers I see at these places are Migrants. I used to make a point of confirming the identification of as many as possible by waiting until they alighted on vegetation (which incidentally, they seem to do quite frequently, especially in the evenings). Of the many that I have been able to check in this way ALL have been Migrants. To be honest, I could do with a refresher course on Common Hawker! There were still a few Common Darter Sympetrum striolatum at Tacumshin yesterday, and at Hook Head a week ago. Just to show that there was a possibility that my probable Aeshna mixta in Co. Down on 8th October could have been Common Hawker Aeshna juncea, I should say that Anne McComb reported one of the latter at Foffany Dam in the Mourne Mountains the previous day, 7th October. 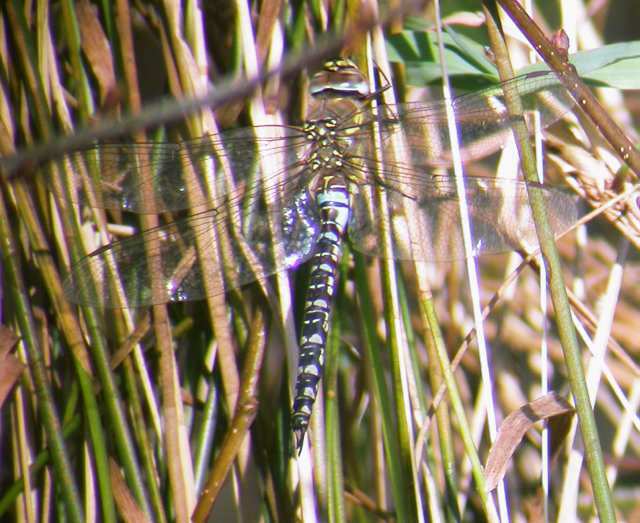 I also understand from Mr. Barrie Sheard that he saw Dragonflies at Peatlands Park, North Armagh, on 8th October; these are most likely to have been Common and/or Black Darters, both of which are common there and can be seen into early November. Common Hawker is also a possibility on 8th October. Geoffrey Hunt also reports Common Darter Sympetrum striolatum at Foynes, Co. Limerick, on 8th October. David Nixon also reports a (female) Common Hawker Aeshna juncea (which he photographed) at King Street, Newcastle, Co. Down, on 8th October. Last Saturday (8th October) was a bright if rather breezy day when I visited South Down, partly with the aim of seeing if any Migrant Hawker dragonflies (Aeshna mixta) had made it as far north as Northern Ireland (I had seen a number at Knock Lake near Balbriggan, Co. Dublin, on 11th September, the most northerly Irish record so far). After searching unsuccessfully at Lough Keelan and Lough Money in the Strangford-Downpatrick area, in mid afternoon I arrived at an interdrumlin lake, most of which is now reed-bed, at Carrickanab near Clough (J453384) where I had also looked unsuccessfully in autumn 2004. When putting on my boots beside the car (at a spot where there are 2 gates close together)I saw a clear-winged hawker which looked on the small side 20-30 yards away flying alongside the hedge. Though by the time I got my boots on and stopped at he spot where I had seen it it appeared to have gone, not too long after I saw it (or possibly another specimen), within about 10 yards, at the junction of 2 hedges about 200 yards from the road, one running almost to the reedbed near the lake. It definitely seemed smaller than a Common Hawker (Aeshna juncea) and indeed was slightly reminiscent of a Four-spotted Chaser (Libellula quadrimaculata). Although I was expecting it to hawk up and down the hedge for a while (as I have often seen this species do in the South of Ireland) for some reason it flew over to the windy side of the hedge. I did not see it again although I stayed for more than an hour and examined the other, windy, side of the hedge and part of the area west of the lake, as well as the hedge close to the road. I cannot be absolutely certain it was a Migrant Hawker but think it highly likely; Common Hawkers are certainly not common in the Lecale peninsula, although not unknown. The habitat (a reedy lake) is similar to habitat where I have seen Migrant Hawker in Cos. Waterford, Wexford, Kilkenny, Kildare/Carlow, etc, but one does not usually expect Common Hawkers in these situations. Assuming that it was a Migrant Hawker, whether it was locally bred or a migrant is hard to say. There was a probable Red Admiral butterfly along the roadside about half a mile away (I also saw 1-3 at Lough Keelan and another on dunes at Tyrella) but this is not necessarily significant, I also saw 1 or 2 Darter dragonflies in the field not far from where I saw the presumed Migrant Hawker, which were probably Common Darters (Sympetrum striolatum), though I did not chase them for fear of losing sight of the hawker. I also saw a mating pair and about 4 other Common Darter Sympetrum striolatum today (13th) at Navan near Armagh; Matthhew Porter also has sent me a picture of a Common Darter taken at Carnfunnock Country Park near Larne, Co. Antrim, on 8th October (there were apparently 2 specimens). To sum up, I am reasonably sure I did see a Migrant Hawker in Co. Down on 8th October, but cannot rule out the possibility it was a (smallish) Common Hawker. Of course it would be great if someone else can could confirm this, either there or at some other lake (usually dominated by Reeds or Reedmace) near the coast of Co. Down. That immature male Common Blue Damselfly Enallagma cyathigerum is still here. Possibly slightly more blue than yesterday. Also in the sunny 16C, were 2 oviposting Migrant Hawker Aeshna mixta and about 4 males, a single male Ruddy Darter Sympetrum sanguineum and c10 Common Darter Sympetrum striolatum inc 2 oviposting. An immature male Common Blue Damselfly Enallagma cyathigerum was a surprise today. This is my latest ever observation of this species, and with it being immature, raises the possibility of getting an October record. Also today in a cloudy and blustery 20C (warm!) c.6 Migrant Hawker Aeshna mixta, c.10 Common Darter Sympetrum striolatum and a possible Ruddy darter Sympetrum sanguineum, but alas, could not confirm. I thought it was interesting to see a Migrant Hawker Aeshna mixta in flight over my lake while raining. It was only 14C and quite windy as well. Also have Common Darter Sympetrum striolatum and Ruddy darter Sympetrum sanguineum present, though the latter are tailing off sharply in numbers. At Toe Head (W12), I had 3+ Migrant Hawkers Aeshna mixta and 7+ Common Darters Sympetrum striolatum on 25th September - apparently a new 10-km-square record for both species. I've also heard of Migrant Hawkers at several 'new' locations on west Waterford coast between Dungarvan and Ardmore in September. Around Craigavon Lakes, North Armagh, this afternoon (25th) there were about a dozen Common Darter Sympetrum striolatum and a Common Hawker Aeshna juncea. At Navan Quarry near Armagh on 23rd September there was a late Common Hawker Aeshna juncea, about 8 Emerald Damselfly Lestes sponsa and about 15-20 Common Darter Sympetrum striolatum, though no sign of Common Blue damselflies. At Brownstown Head (X6298), Migrant Hawkers Aeshna mixta have been very regular during August & September, up to 5 in a day, and I finally got some photos on 17 Sept. Main source is probably a muddy cattle-pond not far from my garden, though emergence not confirmed. Best day so far this year was 11 September, with 2 Migrant Hawkers, 1 Brown Hawker Aeshna grandis and 14 Common Darters Sympetrum striolatum. Latter included a pair ovipositing into a small garden pond I added in August - maybe a bigger pond next year. Concerning the Migrant Hawkers seen by me at Knock lake near Balbriggan, Co. Dublin, on 11th September 2005, it turns out that this is not the first record of the species in Co. Dublin, as Colm Ronayne has sent me details via E-mail of 1 seen by him in 2004: Aeshna mixta, 1 male, 8th September 2004, south side of Howth peninsula, V.C. H21, Grid Ref: O273371. Hawking, just above head height, along a tree/hedge line in an area of bracken, scrub, and Calluna/Erica heathland on a south-facing slope. Bright sunny day. No open water or freshwater habitat nearby. It passed me twice, back and forth, before I swung my net at it. Briefly examined it before releasing it - a male, no apparent damage, colours fairly clear, and not faded. However the Knock Lake record is the first report of it in numbers in Co. Dublin, and may perhaps be the progeny of migrant specimens there 2 or more years ago. Of course 1 or more of these species (certainly the Common Darter) are likely to be seen later than this; the Common Darter usually flies well into October (I have seen it as well as Black Darter several times in November, with Common Blue Damselfly also on 1st November 1998 and Common Hawker on 3rd November 1975). 13th September : Co. Wicklow : sunny, warm, fresh southerly breeze. Obs while birdng. Blackditch East Coast Nature Reserve : A single Blue-Tailed Damselfly Ischnura elegans and a few Common Darter Sympetrum striolatum. Kilcoole : 3 male Migrant Hawker Aeshna mixta feeding around "the Buckthorn Bushes" between the marsh and the beach. 1 pair in tandem seen flying around the bushes also. On the afternoon of 11th September, in bright and warm weather, I saw a number of Migrant Hawker Aeshna mixta at Knock Lake near Balbriggan, which I believe may be the first record for Co. Dublin and also the most northerly record so far in Ireland. There was at least 1 mating pair and an estimated 5 or 6 males (1 male caught was in very good condition) at the east end of the lake (where I saw Lesser Emperors in mid-July). At the west end of the lake, a suspected female and 1 or 2 males were also seen. This makes approximately 10, nearly all males, but there could have been a few more. I did not search the north end of the lake although it looked less suitable. A bonus was a male Black-tailed Skimmer Orthetrum cancellatum which may still have been in reasonable condition, as the blue and black were still clearly defined. The latest Irish date given in the Dragonfly Ireland book published in 2004 is 3rd September 2000. This is the only time I have definitely seen it in September though I saw a possible specimen at Coolorta in the Burren of Co. Clare (a known site) on 10th September 2002. There were about a dozen or so Darters; Ruddy darter Sympetrum sanguineum seemed to be slightly commoner, with a female and about 4 or so males identified, and 2 or 3 Common Darter Sympetrum striolatum. No Brown Hawkers or any Zygoptera were seen, even though one would expect Common Blue damselflies to be flying. As to whether the Migrant Hawkers were migrants or locally bred, it is hard to say. 2 Red Admiral butterflies and 2 Silver Y moths were seen, but I have seen these widely in small numbers in various counties in the Republic of Ireland during the last week, so this may not be significant. Both Emperor and Lesser Emperor Dragonflies were seen here in July by Peter Doyle and others includuing myself; these could also have been the progeny of migrants from earlier years. These 2, together with Migrant Hawker, make 3 Odomata species recorded for the first time in Co. Dublin this year, all (and only) at Knock Lake. This is also the most northerly recorded site in Ireland for all 3 species. I shall be keeping an eye out for Migrant Hawkers in the coming days in Northern Ireland, eg at lakes near the coast of Co. Down. Knock Lake is dominated by Reedmace (Typha latifolia) and there are plenty of suih lakes in Co. Down. I also saw some Migrant Hawker Aeshna mixta at 2 sites in Co. Waterford (Tramore dunes), 1 in Kilkenny (Lough Cullin) and Wexford (Doo Lough); I will supply fuller details of these and other Odonata of interest seen during 3rd-11th September in the coming days. During past week, I've had Migrant Hawker Aeshna mixta and Common Hawker Aeshna juncea ovipositing. I've only seen a single male Common Hawker some weeks back. Ruddy darter Sympetrum sanguineum, Common Darter Sympetrum striolatum, Common Blue Damselfly Enallagma cyathigerum and Emerald Damselfly Lestes sponsa have also been present, though th latter and Common Hawker wern't seen today. Today, I had 3 Migrant Hawker Aeshna mixta foraging together on my drive. Some dragonfly records, mostly seen while birdwatching, but with some photography trips. 28/8/2005: Ratheskar Lake, Co Louth: about 150 Common Darter Sympetrum striolatum, mostly males, with 6 females and a number of mating and ovipositing pairs; about 20 Ruddy darter Sympetrum sanguineum, mostly males, some mating pairs; 16 Blue-Tailed Damselfly Ischnura elegans, mostly males, 1 mating pair; one Common Blue Damselfly Enallagma cyathigerum; 3 Brown Hawker Aeshna grandis; 3 other unidentified hawkers, at least one was not a brown hawker. Plenty of Migrant Hawker Aeshna mixta seen today. Saw 3 at home. A male at the lake, and female near by and another seen near my bog. Also saw them this evening at East Coast Nature Reserve, Newcastle with at least 4 foraging at the north entrance. And then I saw a couple in Newcastle village itself. Still have Emperor Anax imperator on the wing with a male at my lake and the rest near enough the same as previous report a week back. I was up at Knock lake last thursday 18th for a while. Theres a definite dropping off of numbers although the weather wasn't optimum, I spotted 3-4 Brown Hawker Aeshna grandis,10+ Common Darter Sympetrum striolatum,2 Ruddy darter Sympetrum sanguineum , 1 Four-spotted Chaser Libellula quadrimaculata as well as a good number of Common Blue Damselfly Enallagma cyathigerum,and Blue-Tailed Damselfly Ischnura elegans(the latter relatively more abundant than before). I didn't spot Any Lesser emperors but may have seen 1 Emperor Anax imperator though I cant be sure. I've been up there 3-4 times in the past month and the last sighting of Lesser Emperor Anax parthenope was on the 31st July I think when A male was struggling in the grass in front of me where I was just about to step! should have brought the camera that day!. My "bog" (historic fiield name) which I thought may not dry out after the late July rainfalls has receded quicker than expected. A largish area is still quite damp and there are some small pools remaining. In one of these pools I found a final instar Migrant Hawker Aeshna mixta larva. Still masses of small newts. No Migrant Hawker exuvia found since finding the couple back in July. Kieran Fahy broke the news of a probable Golden-ringed Dragonfly Cordulegaster boltonii in south Kilkenny. The deceased specimen has been kept. I live in Newcastle, Co. Wicklow, and on the afternoon of Wednesday, August 10th, rescued an Emperor Anax imperator from a polytunnel in my back garden and I have 9 digital photos, from various angles, of the creature confined in an 11.5 cm diameter sweet jar. I saw one in 2001 at Killoughter (6 km south of Newcastle) as it captured and ate a large white butterfly but had no camera at that time with me. I would have reported this had I not been ignorant of the Emperor's rarity in Ireland at that time. I was at Tacumshin for a couple of hours during the middle of the day yesterday (15 August '05) and saw at least 8 Emperor Anax imperator, most of the at the East End pool (Sigginstown). Also, two male Migrant Hawker Aeshna mixta at the same place. Brown and Common Hawkers: Seen I think every day except 2 or 3 somewhere, and in nearly all of the above counties. Hairy Dragonfly: Possible specimen (ie a smallish hawker) seen at Dromore Wood in Co. Clare: I have seen this 2 or 3 times in the 1st few days of August in Northern Ireland so this is not impossible (as far as I know it does occur at this site; I think I remember seeing it there in May 2002). Black-tailed Skimmer: Seen at at least 2 sites in the Burren and near Lough Carra, Co. Mayo. Ruddy Darter: Seen in Cos. Clare, Galway, N. Tipperary and Carlow. Black Darter: Seen in Clare (1) and Roscommon (c. 4). No Keeled Skimmers or Four-spotted Chasers were seen. I wasn't really in the areas where one would expect Anax species or Migrant Hawkers. Banded Damselfly: Seen in Cos. Carlow and I think 1 or 2 other counties. I was shown a few on the River Slaney at Altamont Gardens by the Duchas Warden, Paul Cutler, who also told me he had seen C. virgo there. I also saw a Brown hawker, 1 or 2 Ruddy Darters and Common Darters, but failed to see Common Blue Damselflies even on the larger lakes (perhaps there was too much floating vegetation; I think this species, surprisingly, has not been reported from Co. Carlow!). I looked for Beautiful Damselflies at a site in Mayo (Belclare near Westport, where I have seen it in 1999 and 2000) without success. Blue-tailed Damselfly: A few seen. Variable Dfly: 1 at Scragh Bog, Co. Westmeath: I also saw another somewhere else. Azure Dfly: 1 at Dromore Wood in Co. Clare. Emerald Dfly: Seen at 1 or 2 sites. Scarce Emerald Dfly: I saw a few at Newchapel Turlough in North Tipperary and 3 at a new site,a turlough at Castle Taylor, Co. Galway. A possible Emerald was seen not far from a marshy area at the Hill of Curry in Co. Westmeath which is a possible looking site. I also thought Glen Lough in Co. Longford/Westmeath might prove possible but no Odonata were identified here. 2 Scarce Emeralds were seen by some Welsh moth enthusiasts at Ballyvelaghan Lough in Co. Clare in the 1st week of August (though they recorded 25 Lestes sponsa); probably also seen here on 8th by several NI people. Weather during the fortnight was reasonable, with little rain during the day but 1 or 2 wet nights. There were however only about 2 days when it was really sunny and the temperature got to about 20 deg. C. or so (according to the car thermometer) whereas during the week in June some of the days got to 23-24 deg. C. It was also cloudy and sometimes rather breezy. Unfortunately forecasts of really good weather eg during the 2nd week, did not materialise. The ground looked pretty dry in a lot of places (though vegetation was not suffering) and turloughs were at low levels ior dry in the Burren (yet in mid June levels had been high). I was told that a tanker I had seen around Lough Bunny in the Burren would have been collecting water! I'm a little out of touch with Odonata this summer, as most of my birding activity in recent weeks has been confined to evening times. I guess there must be plenty of Migrant Hawker Aeshna mixta to be found at the regular sites during the warmer part of the day, though I have not actually heard of them being seen at Tacumshin, Or lady's Island, so perhaps they have not appeared in the numbers we come to expect over the past few years? I came across my first only yesterday evening, at 19.00, while driving on a very small road that borders the southern limit of the Johnstown Castle estate, near Murrintown Co. Wexford (T0315). It looked like a dull (immature?) male. I've just had captures of a video sent to me. It clearly shows an Emperor Anax imperator oviposting into seaweed in the water in North Harbour, Cape Clear Island Co. Cork. I have no idea if this is unprecedented behaviour or not, but interesting none the less. In early August, I had Migrant Hawkers Aeshna mixta at three locations in east Co Waterford (3 at Belle Lake S665046 & 1 at Brownstown Head X6298 on 1st, 1 at Annestown Bog S4900 on 2nd). Other good local sightings included 2 Ruddy Darters Sympetrum sanguineum at Belle Lake on 1st, 4 Beautiful Demoiselles Calopteryx virgo at Kilmurrin (X4699) on 2nd (new 10-km record), and 8 Common Darters Sympetrum striolatum, including ovipositing, at Brownstown Head (X6198) on 1st August ("new" 10-km record but previous sightings exist). Also, Adrian Allen photographed a female Emperor Anax imperator ovipositing at Fenor Bog (S5301) on 1st August. Season is finishing for many species. No Azure Damselfly, Four-spotted Chaser and Large Red Damselfly seen this month. Today, had a single immature male Migrant Hawker Aeshna mixta foraging over the garden meadow. It clashed briefly with an Emperor Anax imperator. Getting close to latest date for Emperor Anax imperator here with a male and an ovipositing female seen. Also today, Common Blue Damselfly Enallagma cyathigerum, Emerald Damselfly Lestes sponsa, Blue-Tailed Damselfly Ischnura elegans, Common Darter Sympetrum striolatum and Ruddy darter Sympetrum sanguineum, with the latter outnumbering the former, which is unusual. I've had no luck with finding further exuvia of Migrant Hawker Aeshna mixta. The 49mm rain that fell on July 28th rose the water level in my"Bog" by nearly a foot, doubling the surface area but increasing the emergent plants by more than 10 fold. After much searching today I found a single larva in what I think was 2nd last instar. Plenty of young newts though. I think it's likely that my "bog" won't dry out this year, though September can be a very dry month so still a bit to go. c.10 each of Emerald Damselfly Lestes sponsa and Blue-Tailed Damselfly Ischnura elegans. Pair of Emeralds seen in tandem.